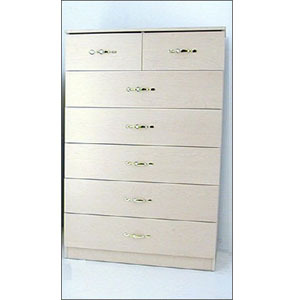 This Chest Of Drawers Features Seven Drawers. Beautiful Design. Strong Construction. Melamine. Size: 32W. x 16D. x 53H.. This Chest Is Also Available In Custom Size. If You Would Like A Particular Size, Please Indicate The Size In The Shipping Comments Box Or Contact Us Via Email Or Telephone. *To See Colors Available Please Point At The Color Sample Picture Shown Left/Below. This Chest Is Shipped Fully Assembled. *Local Delivery Or Store Pick Up Only. Click Here For Color Chart . The Color Choices Below Are For Cabinets Made Of 5/8 In. Melamine. We can also make them in Solid Birch Wood Finished Or Unfinished.